What follows is a long letter I sent to my girlfriend Emily when she inquired about what I meant by the “four folkways” of American culture. This is my basic understanding of the cultural argument of Albion’s Seed, the masterwork of David Hackett Fischer. Perhaps I will write such an essay. 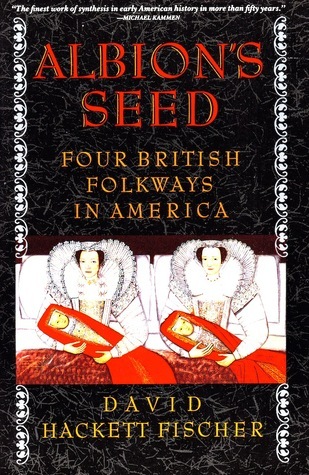 “so the folkways theory, or the “Albion’s Seed Thesis” (Albion is an old word for England, and then seed as in its descendents) basically argues that there are four distinct and broad American cultural regions rather than one singular American culture, and that those four regions have differing ideals and have competed over the course of centuries, defining the American identity and determining American politics. There are some other cultural regions, but they are less influential and widespread; and most immigrant groups assimilate and take up the characteristics of one of the cultural regions, anyway, or at least bind themselves to it culturally. Those four cultures were the Puritans of New England, the Quakers of the Mid-Atlantic colonies, the Cavalier Virginia gentlemen of the coastal South, and the Scots-Irish frontiersmen of Appalachia. In addition to these four Americas, there are the Dutch-influenced New Yorkers, the French-influenced Louisianans, and the Caribbean-descended deep Southern planters. Blacks brought their own folkways but, interestngly, have largely grafted onto the Scots-Irish and Cavalier cultures, while Hispanics have largely grafted onto the Scots-Irish culture and Asians have largely grafted onto the Puritan cultures. Meanwhile the flood of European immigrants that populated the cities of the East Coast and the Midwestern states largely assimilated into the Puritan (or Yankee) and Quaker (or Midland) cultures. So let’s say Yankees and their descendants are dark blue, Midlanders are purple, Cavaliers are pink, and Scots-Irish are red. The whole northern tier of America is blue, from DC up the coast to Maine, inland to Chicago and Detroit and Minneapolis-St. Paul, and still blue in the rural belt across the Great Plains and Rockies to Seattle, and blue from Seattle south to San Francisco. Additionally, all the major urban cores have some level of Yankeedom, because the Yankees have largely influenced American elite educational and corporate culture. The Ohio Valley from Philadelphia out to the Mississippi River is purple, as the descendents of Quaker midlanders, no longer practicing that faith but still influenced by it, fanned out in a straight line moving West. And their descendents in turn settled the Salt Lake City area and the central Great Plains and Rockies, including Colorado. From DC south to Florida and west to Houston, it’s all pink along a narrow strip on the coast. The lowlands of the South are dominated by the once-powerful planter elite; after the Civil War they were neutered, and after the New Deal they’ve largely been reduced to modern libertarian and corporate movements. But something of theculture still survives on the southern coastal strip, and ironically, in every major American city where there are concentrations of wealth. And the Scots-Irish territories- Appalachia, Missouri, Texas, the Southwest and Southern Great Plains, and the Southern Rockies- are deep red. So are a bunch of other rural areas, actually, because the Scots-Irish fanned out more widely than any other ethnic group. And so vast stretches of the American hinterlands from central California to west Virginia to Montana to Texas feature their culture. Now, the only solidly-colored regions are the East Coast heartlands of these cultures, because as they moved West they intermingled- for example, the Southwest is a blend of Scots-Irish folkways and Hispanic folkways, while California is a curious mix of all four types and the northern Rockies and northern Great Plains had a cultural fusion of Midlander Quakers and Scots-Irish. And other dynamics, especially class and the rural/urban divide, come into play very prominently. But generally, there are these divides. What’s interesting is how this comes into play politically and culturally. Yankee Puritans primarily favor social reform and activist government- they animated every major refrm movement in American history, and they’ve always been on the side of the Big-Government party (Federalists, Whigs, early Republicans, New Deal Democrats.) There are liberal ones (Franklin Roosevelt) and conservative ones (Theodore Roosevelt.) They largely influenced America’s corporate and educational elite. Quaker Midlanders are temperamentally more moderate and favor an ethic of industrialism and a a nonviolent, egalitarian ethic. They’re currently the swing states (Ohio, Pennsylvania, etc) and have historically followed suit with the Yankees, almost but not quite grafting themselves onto them. Figures like Dwight Eisenhower and Abraham Lincoln represent this actually pretty boring tradition. They’ve largely informed the development of American industry and labor. Cavaliers have always favored a strong, traditionalist, conservative society, an ethic of temperance and self-control and greatness, and minimal government oversight. They’re basically dead now as a regional force, but again, they live on through the libertarian movement and some great gentlemen from the south. George Washington and Thomas Jefferson- reserved, quiet gentlemen of strong character and elitist pretensions- characterize Cavalier society. Scots-Irish or Jacksonians are also very anti-government, and even more, incredibly individualistic and violence-prone. They are moral traditionalists who prefer an ethic of survivalism. Andrew Jackson was the archetype Scots-Irish, though you can see this movement alive in every populist movement in Americanhistory. They’ve been the pioneers and frontiersmen since the Founding. You can probably guess where these cultures fall politically these days; the far right is a mix of Scots-Irish and the remains of the Cavaliers, while the far left is a bunch of radical Puritans with some Cavalier finance. The establishment wing of the Democrats is Yankee/Quaker, while the establishment of the Republicans is Scots-Irish/Quaker. And the cultural divides follow regional lines, too- coasts and northeast for the Blue-Purple Democrats, West and South for the Red Republicans. So the first two things you’re probably wondering are 1) what are you? and 2) what am I? I am ashamed to admit that I don’t know you politically well enough to say for sure, but my instinct is that you are of the conservative wing of the Yankees, with some rugged folk Scots-Irish in you. Sacramento was settled by the Scots-Irish and, you know this because the area around it votes Republican, it remains a region fiercely proud of its pioneer heritage. But you’re also middle class and somewhat progressive,which adds the Yankee strain. As for me, you know the dilemma- I don’t have a homeland, so I wasn’t brought up geographically in any of these cultures. My family does have Scots-Irish and Quaker roots, though, my dad being from Ohio and my family being conservative traditionalists. But all my political heroes, or a great many of them, were Whigs- and Whigs were typically Northeastern conservative Yankees. I complain about the activists all the time, but I favor activist government as much as they do. I think I would describe myself as a Southern Whig, then- holding some of the values of the Scots-Irish traditionalists (andhoping to emulate the Cavalier gentlemen) while viewing government the way the Yankees do. And with some Quaker industrialism mixed in. The big question I have is 1) how have these four cultures evolved 2) how has the presence of non-Anglo migrants altered that dynamic and 3) what does the cultural-politicacl climate of 2016 look like in Fischerian terms. I don’t really know how to answer any of these at the moment. Here’s my prediction that’s probably wrong, but which I really hope isn’t. In 2016, I don’t think Jeb Bush is going to get the GOP nomination. (I really hope he does though.) The party base is too angry at Obama to nominate a centrist, and the most reasonable candidate we’ll get is probably Marco Rubio. There’s a real likelihood it’ll be someone more along the lines of Scott Walker, though- hopefully not further to the right than that. God forbid Trump or Cruz. In a Walker vs Hillary or Rubio vs Hillary race (I’m sorry Sanders fans, but he’s NOT EVEN A DEMOCRAT) I think the GOP would get wobbly. Never thought I’d say this, but I’d probably put my bets on Hillary- I think she’s far more likely to catch centristsand run as a uniting candidate than Walker (even though her current strategy is mobilizing liberals,) and something tells me Rubio just doesn’t have the… buzz, for lack of a better word. Yes, I’m saying a young Hispanic male Republican would lose to an old white female Democrat after 8 years of a mediocre Democrat. I’d LIKE another President Bush, but I’m currently expecting (as of July 2015) that we’ll have another President Clinton. I don’t think that’s ALL a bad thing, by the way; while I don’t think she’s a strategic thinker, and I don’t think she’s a progressive reformer, and I think she would perpetuate a lot of the old regime rather than giving us genuinely new thinking, I would prefer Hillary over more liberal Democrats, and I think she’s been making some smart statements recently, even moving towards the center. I wouldn’t mind working for her if I pass the Foreign Service Exam. Anyway, here’s the part where it gets juicy- no party in our modern electoral system has held power for more than twelve years, since Franklin Roosevelt. Especially if Hillary became basically an Obama 2.0, (and I think there is a strong possibility of that happening) I think she would be a one-term President, unless the GOP of 2020 is so delusional that they run a far-right crazy. But they won’t, because they’ll have another option by then. Have any of my fellow Huntsmaniacs been watching Jon Huntsman? The former Governor of Utah and Ambassador to China is still quite active in public life, though not in elected office- he chairs No Labels (a bipartisan advocacy group that is gaining quite a lot of ground nowadays) and the Atlantic Council (a strong, but not hawkish, foreign policy think-tank.) In these two roles, Huntsman weds his foreign policy expertise and his penchant for centrist bipartisanship, remaining relevant through speaking engagements, occasional op-eds, and the like. He also served as CEO of his family’s Huntsman Corporation, a chemical producer. He’s currently somewhat estranged from the GOP after having made comments suggesting a Third Party would be beneficial back in 2012, but retains a serious fanbase nonetheless. As if his resume weren’t formidable enough already, there have been whispers that the former Governor might choose to run for the retiring Orrin Hatch’s Utah Senate seat in the 2018 elections. Already a celebrity figure for the moderate movement in the United States, a Senate seat would bring him and his outspoken moderation back into the national spotlight, and back to power. Additionally, a legislative role would round out his resume- lawmaker, executive, and foreign policy expert, even a family businessman, not to mention a leader in one of the country’s foremost political reformist groups and one of its most respected think tanks, and a figurehead for a movement, indeed a whole political temperament. He’d be a shoo-in for the Presidency, especially if partisanship has worsened and relations with China have grown tense 5 years from now. But wait! you might say. Wouldn’t the GOP be more inclined to nominate a crazy after 12 years of liberal Democrats, and seek red meat? That’s certainly reasonable, but it doesn’t match the historical evidence. It seems more likely that parties lost in the wilderness for multiple presidential terms actually do a lot of soul-searching and reflection as to why they kept losing, rather than take advantage of stagnation to get as much of their agenda accomplished as possible. Note that George McGovern secured the Democratic nomination in 1972, after only four years of Nixon, and that Barry Goldwater secured the GOP nomination in 1964, after only four years of liberal Democrats (technically two terms, JFK’s and LBJ’s, but timewise it was worth one.) Then note that after the 20-year FDR-Truman dynasty, the GOP nominated Dwight Eisenhower, who was a real icon for political reform and moderation in his days (not unlike Huntsman today.) And after the 12-year Reagan-Bush reign, the Democrats nominated the moderate Bill Clinton, who had chaired the reformist Democratic Leadership Council and was about as moderate as anyone could be in the 1990s. Parties really do seem to moderate some after exclusion; if Hillary wins in 2016, we’ll see if it happens again. Given the above, Jon Huntsman in 2020 will be the perfect candidate for the GOP next cycle- more government experience and more diverse government experience than other candidates are likely to have, some business experience, a maverick penchant for political reformism, and wide centrist appeal. Who else can fit Governor, Senator (soon, hopefully,) Ambassador, CEO, Civil Society Leader, Think-Tank Chair, AND Movement Symbol onto a single resume? Not only that, but he will likely, like John McCain in 2000, seem to be somewhat outside the mainstream of the GOP, yet still within it (abetted by his possible Senate years.) And even if he loses in 2020, he may just choose to complete his Senate term, and throw his hat back in the ring in 2024. By my measure, it would seem that the currently-brewing international and domestic crisis point will resemble the Crisis of the Founding, the Crisis of the Union, and the Crisis of the New Deal in its ultimate effects- not just a reformation of, but ultimately a reforging of, the American Republic, to create a Fourth Republic of the United States. Just as the First Republic before 1861 differed sharply from the Second Republic after 1865, and just as a new Third Republic emerged in 1945 that differed from the America of 1929, so it appears we are entering one of those crisis points of our history when true political creativity and magnanimity will be required to move our country into the next era. The ideas for what that next Republic might look like are out there; they just need a voice and a will. I have a strong feeling that Jon Huntsman will be that voice and will. He has the potential- and probably the propensity- to be a uniting, innovative leader, pursuing new ideas and forging new institutions. His Hamiltonian-Jacksonian credentials are clear- after all, he strongly admires Theodore Roosevelt, probably the greatest of the Hamiltonian-Jacksonians in American history, those who use the activist power of government to create and sustain better new realities for the broad middle class. Moreover, the periods directly preceding Abraham Lincoln and Franklin Roosevelt, two of the transformational presidents, were chock full of mediocre leaders and halfwit politicians. And the years before George Washington saw a mishmash of uninspiring representatives in the Continental Congress. This is normal. And it won’t last. But in any case, it should be clear that Jon Huntsman is planning on getting back into public life in some capacity, and that a period of great reform is needed to rejuvenate American greatness. Should these stars align, the country will be much better off for it. 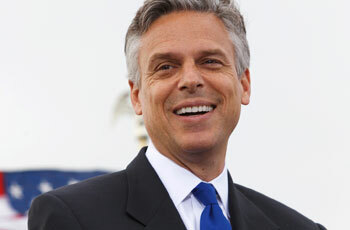 I really, really hope I get to vote for- or work for- Jon Huntsman in 2020.